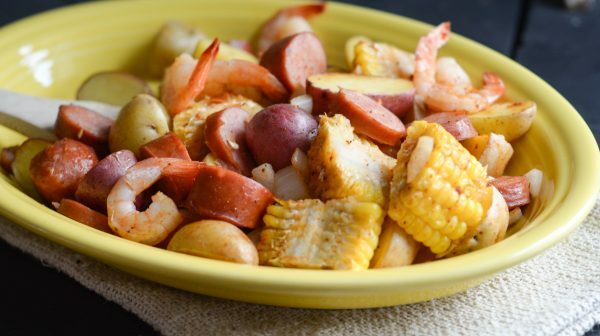 Get ready for a twist on a classic Cajun Shrimp Boil by making this Cajun Shrimp “Boil” in the Air Fryer. Have you tried an air fryer shrimp recipe, yet? I have to say that air fryer shrimp has quickly become an easy go-to for us at dinner. The irony is my kids that are so picky about food, they happen to love shrimp. That makes air fryer shrimp a win at our house. 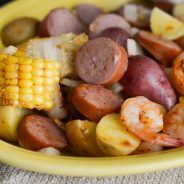 This past week, I decided to do my own take on a Cajun shrimp boil but move it to the air fryer instead. Now, I’m calling this Cajun Shrimp Boil in the Air Fryer because technically it’s not being boiled; however, that’s essentially what it is too. What’s a girl to call it? I’ll let you just enjoy the fact it took me a long time to figure out what to call this because honestly, it’s an Air Fryer Cajun Shrimp, but it has a lot of extra ingredients too. 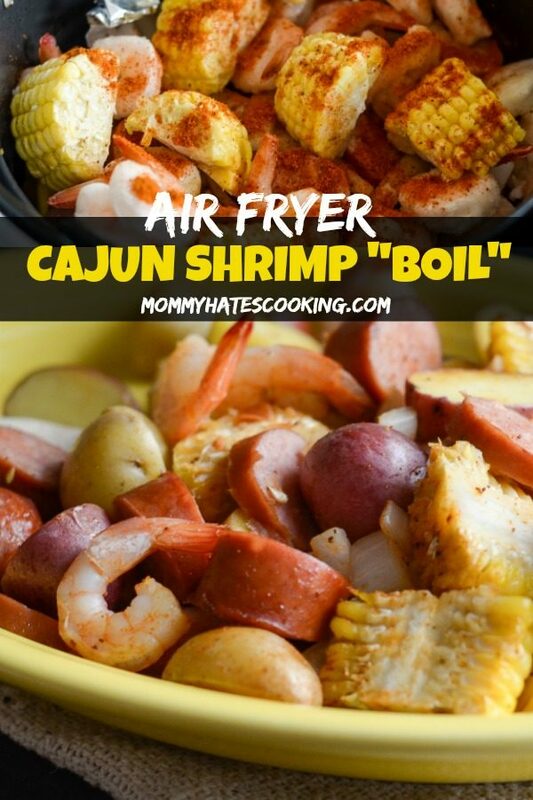 How do you cook Air Fryer Cajun Shrimp? For this particular meal, it’s going to consist of several different ingredients mixed in with the shrimp. Once all the ingredients are mixed together, it will be cooked in the air fryer at 390 degrees for 12 minutes. Easy! 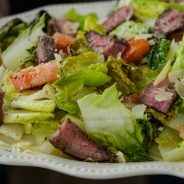 Why do you need to Par-Boil the potatoes? I highly suggest par-boiling the potatoes before adding them to this dish. Par-boiling is simply cooking them a little bit, but not the entire way. This particular article on 3 Reasons Why You Should Par-Boil Potatoes, will be extremely helpful in explaining this. 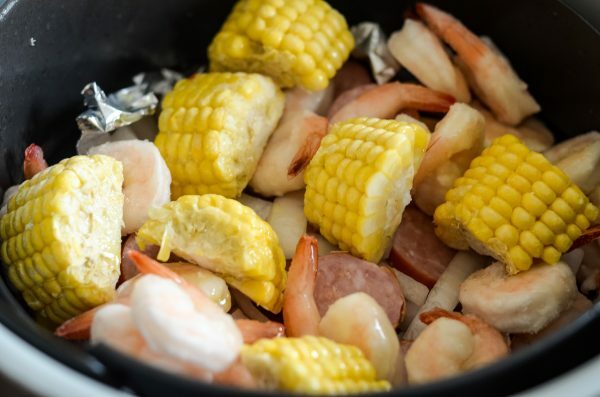 In this article it speaks about par-boiling for grilling; however, it is the same for this Cajun Shrimp “Boil” in the air fryer. In order to do this, simply bring water to boil, and boil the potatoes until when sliced with a knife they are cut easily but not so soft that they fall apart. This typically takes no more than 5 minutes. By par-boiling the potatoes, you can be sure that they will come out nice and tender once everything is cooked. 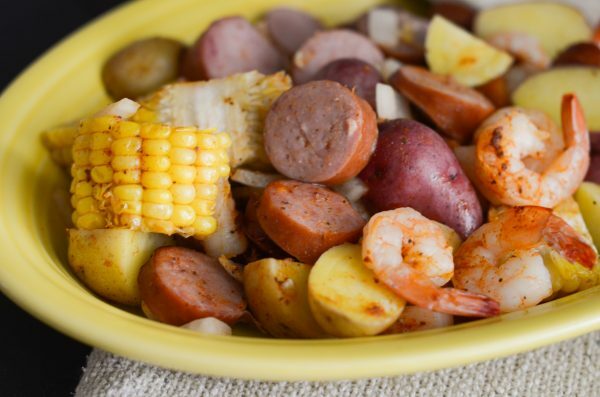 What do you need for Cajun Shrimp Boil in the Air Fryer? 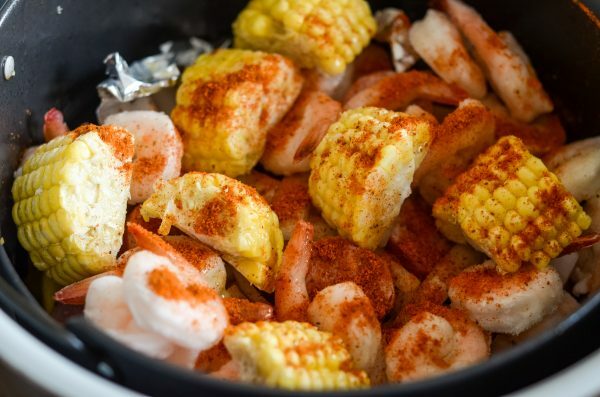 Why should you use Old Bay Seasoning for Cajun Shrimp “Boil” in the Air Fryer? 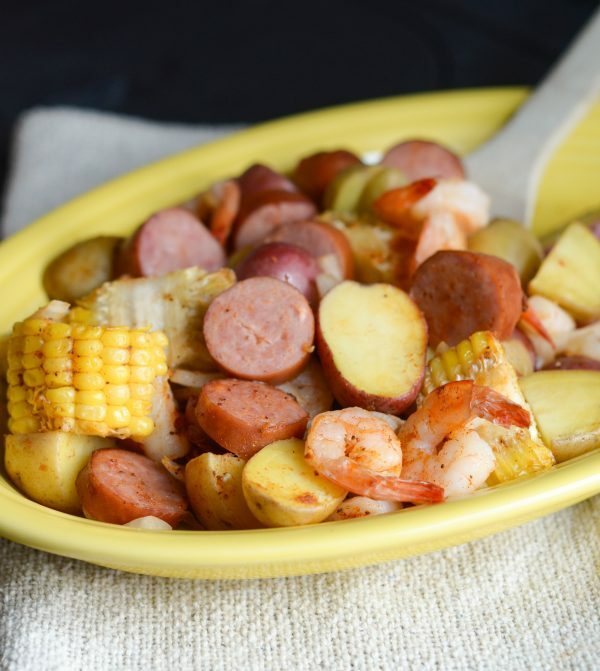 For this recipe, you can use any cajun seasoning that you prefer; however, we have found that Old Bay Seasoning has the perfect mixture of herbs and spices to truly give this dish that cajun flavor we were going for. 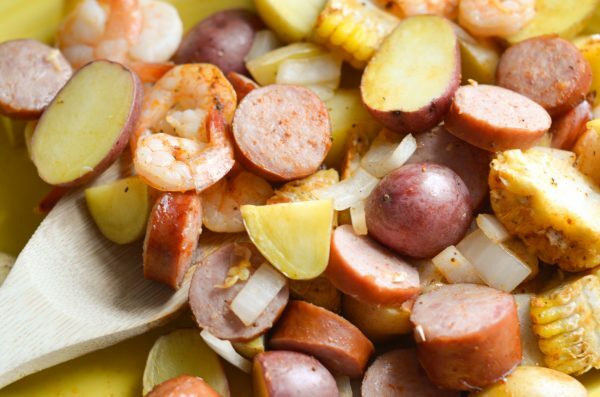 Make your favorite Cajun Shrimp Boil in the Air Fryer in just 12 minutes! Begin by being sure the potatoes have been par-boiled. We use small potatoes, cut in half for this recipe. Once the potatoes are done, combine the remaining ingredients into a large bowl, mixing well. Place a sheet of foil into your air fryer, being sure that air is still able to circulate. Add in about 1/2 of the mixture on top of the foil to fill the air fryer basket. Note - We used a 4-quart air fryer basket, so we made this amount in 2 batches. Once the ingredients are added, spray with a nice coat of olive oil spray. Cook at 390 degrees for 6 minutes. Open up the air fryer, carefully mix the ingredients. 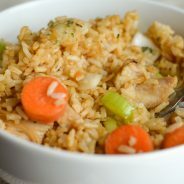 Cook for an additional 6 minutes. Repeat these steps for the next batch if needed. Remember, every air fryer heats differently. The air fryer I use does not need to be preheated. If yours does, be sure to preheat and then move forward with the instructions. After 12 minutes, it should be nicely cooked and warm. Again though, all air fryers heat differently, so just be sure it's warmed up to your preference. I always recommend checking the dish 1/2 way through the cook time to be sure it's cooking nice and evenly.